There are several types of dentures, but they all share a common function. They replace teeth that have become loose or lost due to bone loss. When bone loss around the roots of teeth is great enough to loosen them or let them fall out, it’s time for dentures. While no one enjoys losing their natural teeth, you can still eat and talk normally with dentures. The entire mouth is examined and a determination is made as to which teeth will have to be removed and which will remain. The loose teeth are then extracted. Dentures are fitted to go over, or around, whatever teeth remain in the mouth, depending on the type. There is an adjustment period after dentures are placed in the mouth and it can take some getting used to. Once accustomed to the dentures, all the normal functionality and appearance return and one just carries on as usual. 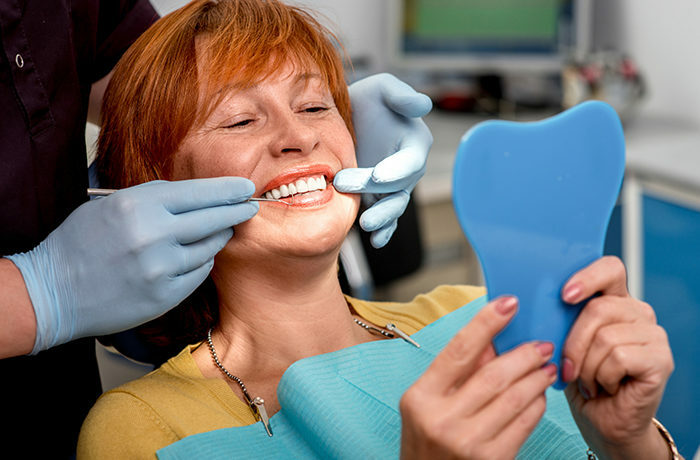 Often times, implants can be used to further stabilize dentures.